In today's Washington Post we have a piece on left-handed presidents. [Original article as PDF] The next president will be left-handed, since Barack Obama and John McCain are both southpaws. They are the latest in a long run. Since 1945, five of twelve presidents have been left-handed: Truman, Ford, Reagan, Bush I, and Clinton. Yet only one in 10 people in the general population is left-handed. We wrote about the question of whether there's something about the brains of left-handers that qualifies them for leadership. The answer is maybe - and in a way that may help explain Barack Obama's way with words. 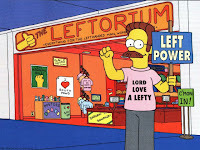 The piece was condensed quite a bit - partly to accommodate a picture of Ned Flanders's Leftorium. If you're interested in a fuller version, complete with links to PDFs of supporting literature, it's here. As a left hander, I'd like to think there was something that marked us out as leaders but I think it's just coincidence there have been lots of lefty US presidents. After all, there doesn't seem to be much evidence of lots of left-handed presidents or prime ministers in other countries. Carole, that's a good point. 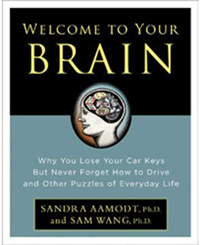 When we were approached about writing this we realized that the interesting question is what might distinguish the brains of left-handers from those of right-handers, given the fact that there are a lot of them who have become president lately. That having been said, there hasn't been a good test of the idea until recent decades because left-handedness has been discouraged in previous times - and in some countries, even today.